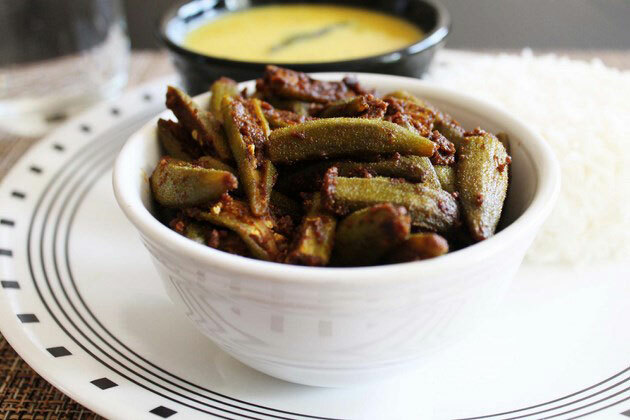 Bhindi Masala Recipe or bhindi fry– Indian style cooked okra with lot of different spice powders. It is very easy and quick to make semi-dry kind of sabzi. I just gave this dish a name ‘Bhindi Masala’ because we are going to use lot of malasa (aka spice powders) in the recipe. 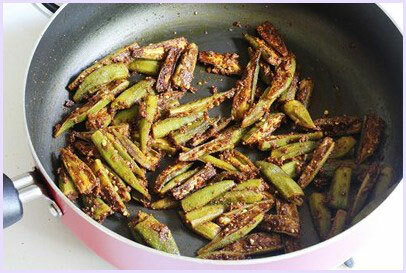 This is the best ‘no onion no garlic bhindi fry recipe’. This subzi has ton of flavors, it has balanced flavor of sweetness and sourness from fennel and amchur. You can adjust the red chili as per your taste. 1 teaspoon will give you medium spicy taste. I usually make this okra sabzi once in two weeks. Dear husband always loves any bhindi recipe. I got this recipe from a cookbook. Now I do not remember the name of cookbook. Hubby dropped me to the nearby library while he was attending his work meeting. I found an interesting Indian cookbook and noted down the recipe in my note. The original recipe was for stuffed okra. But I like the stuffed one Gujarati style, so made the recipe this way. But if you want you can stuff the okra with this masala. 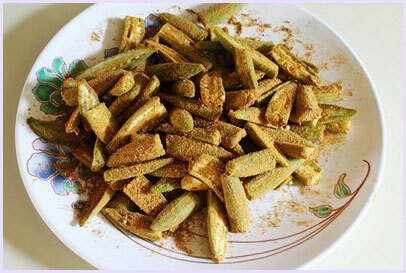 Just make vertical slit in okra without breaking it into two and stuff the masala mixture and cook. Here I have shared stuffed okra. aloo bhindi // bhindi do pyaza // bhindi bhaji // crispy bhindi fry. 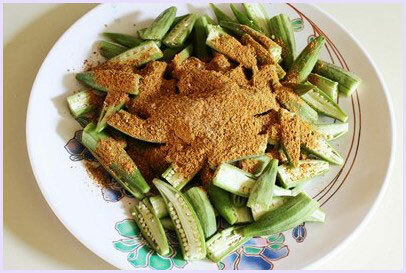 1) check out here, how to clean and cut okra, so it will not be slimy. 3) Mix them well along with the salt. 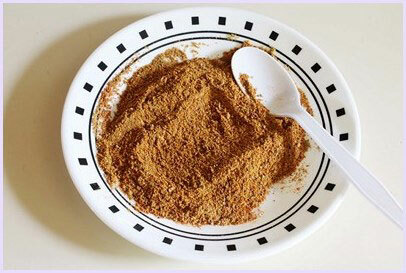 Be careful while adding salt, as your chaat masala might have some salt in it. 4) Add spice mixture to okra. 5) And mix well with the hand, so that all the masala is coated well. Why not add spices in the pan along with orka in the oil? Because in this recipe there are too many spices and to get mix properly you might need to stir for a while with spatula. And as you know that okra will become slimy if you stir it too many times. That’s why I added before. 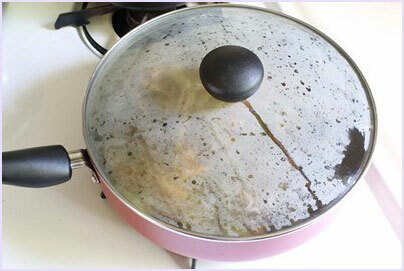 6) Heat the oil in pan on medium heat. Once hot add okra. And mix once so oil gets coated. 7) Cover the pan and let it cook. Stir in between to make sure that okra it not sticking to the pan. As okra cooks, they shrink and become darker in color. 8) Once cooked switch off the stove and serve. 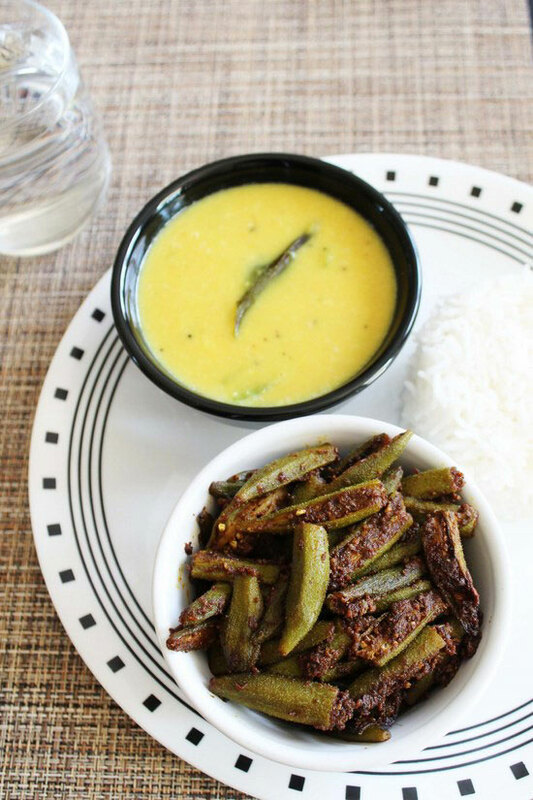 Serving suggestion: I have served this bhindi masala as a side dish with Goan Varan bhaat. Like all other dry subzis, this can be served with phulka or paratha. It can be served with dal-rice combo as well. Wipe and dry those well using paper towel or kitchen towel. Then cut the head and tail part off. Slice okra in half. While slicing the okra do wipe off the sticky knife with paper towel, this also helps to avoid stickiness while and after cooking okra. Do repeat cleaning knife as it gets sticky. 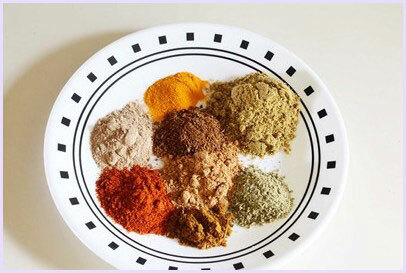 Now take all the dry spices in a bowl and mix them well along with the salt. Add spice mixture to okra. And mix well with the hand, so that all the masala is coated well. Heat the oil in pan on medium heat. 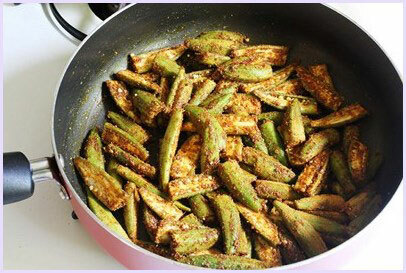 Once hot add masala coated okra. And mix once so oil gets coated. Cover the pan and let it cook. Stir in between to make sure that okra it not sticking to the pan. Once cooked switch off the stove and serve. Very happy to hear that it came out good. 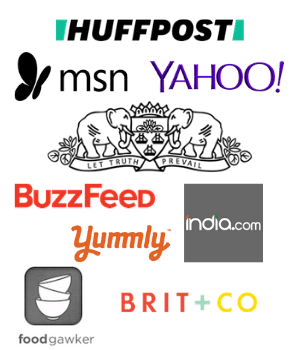 Do give it a try, you will like it. Thank you Sana for the feedback. Happy to know that you liked.